At one of the Free Trade Hall gigs, Rick Wakeman drank eight or nine pints and began thinking of curry. He told his keyboard tech below the stage, "John, we'll go for curry when this is all over." John only heard the word "curry" over all the noise. Twenty minutes later, he brought Rick a chicken Byriani, a few poppadoms, and an onion Bhaji. Rick enjoyed the smell and decided to lay the cury on his organ and eat it. Jon turned to him and said, "I don't believe it - he's eating curry!" Steve Howe was also displeased. 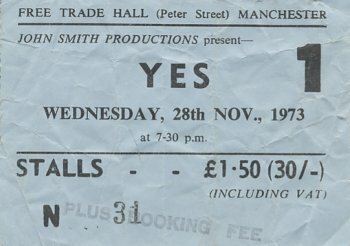 My older brother and I had seen previous YES shows at the Free Trade Hall and we dragged our younger brother to see the gig having raved on to him about how fantastic a band they were. We knew they were going to play some new songs but everyone was a bit taken aback with the whole double album ..especially my 13 year old younger brother who was heavily into three minute musical gems by Bowie! We were seated at the front just by Rick Wakemans feet and I always remeber him playing "theres no business like show business" as the band came back on after the interval. 34 years later I have my own YES tribute band SEYES (www.seyes.co.uk) and our big plan for 2008 is to play ALL Topographic live at some special venues.The music on that album was and still is ground breaking for five men to play in concert. 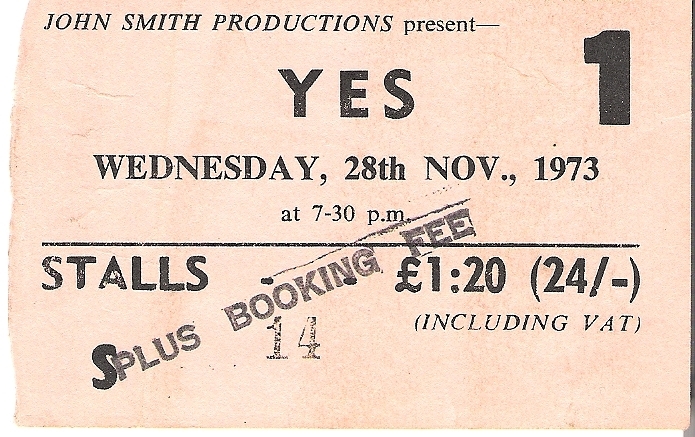 This was the first time that I had seen YES live, they were so note perfect, that my wife thought they were miming!! What a day & night. I had been for a job interview the previous week, & had been told to ring that evening to see how it went. I got the job, the 1st big career break, topped off by the show afterwards. Been an avid follower ever since. Just seen that Rick & Jon will be in my hometown of Doncaster in October. You bet that I will be 1st in the queue. We were waiting ages for this gig. 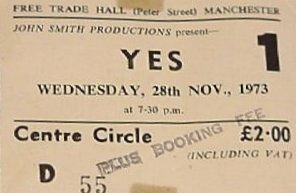 It seemed like years since we had seen Yes. Before the gig in the foyer I had pinched a copy of the sleeve to Close to the Edge from the stall, I also bought a T shirt which 2 years later I swapped for a copy of Quadrophenia, I know which I should have kept! The gig itself was absolutely brilliant, the first half was all of the old stuff, Close to the Edge, And You And I, etc etc. The second half was totally Tales From Topographic Oceans, they played all four songs and at first hearing they were abit strange but thirty years later they are all classics. The two most abiding memories are of the drum solo in Ritual and the drum cage rising intothe air, and of Chris Sqire playing the biggest accoustic bass guitar you have ever seen in your life. Good luck to all you Yes fans who read this. Listen to Close To The Edge on Yessongs before you listen to anything else, then listen to the same song on Keys to Ascenscion, then you will be able to hear the difference. Jon Anderson was only in his early twenties when Yessongs was in the shops, I think I bought it for �4.29!